It’s Memorial Day weekend, the official holiday of decluttering! I performed my patriotic duty by spending about an hour clearing and cleaning out some space in our third bedroom. I have decided that I would like to have a space in the house for meditation, studying, indoor ritual work, and so forth. A space that is clean, fairly free of cat hair, and has good energy. 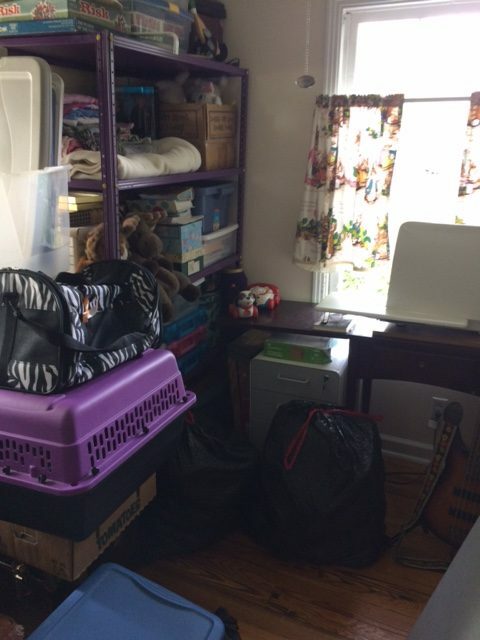 Since we moved into our home 15 years ago, the third bedroom, or as we call it “The Third Room”, has been a sewing room and a music room, but always, always a depository of junk, unused items, and a general dumping ground for, you know, “stuff”. So I waded into the mess. I lit a sage candle (sage helps with cleansing), and some jasmine incense to make the room smell better, and put some upbeat music on my iPhone. I set myself a single small goal: clear enough space on the storage shelf in the room to store blankets and bed linens. You can see the shelf in question to the left in the photo. So I moved some things around, threw some things out, and did a A LOT of cleaning. And I was able to clear PLENTY of space for those blankets. 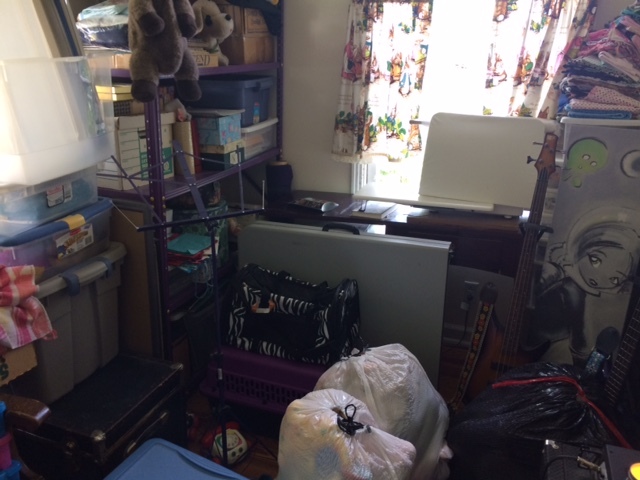 I was also able to clear enough room in the floor to actually walk into the room, rather than climbing into the room. I finished up by sweeping the floor and mopping with some soap and water and a bit of lemon essential oil to freshen the room. Only a little bit of time and work, and I have a big improvement – and a place to put my linens!